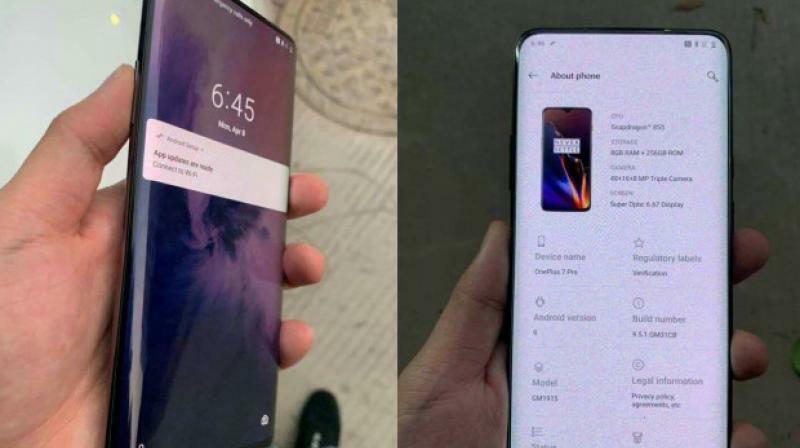 New details about the OnePlus 7 Pro have leaked showing that the Chinese smartphone manufacturer is getting ready for a hot 2019 trend. The OnePlus 5G handset had been previewed at MWC 2019, however, it was in a protective casing that concealed its design. Since then the rumour mills had been rumbling about the brand’s 5G handset and if the latest leak is anything to go by, then the upcoming OnePlus 7 Pro will be the model to boast this feature. As per a report by GSMArena, two images of a supposed OnePlus 5G handset has surfaced on Weibo and with it, we get a glimpse of the specs that it will entail. 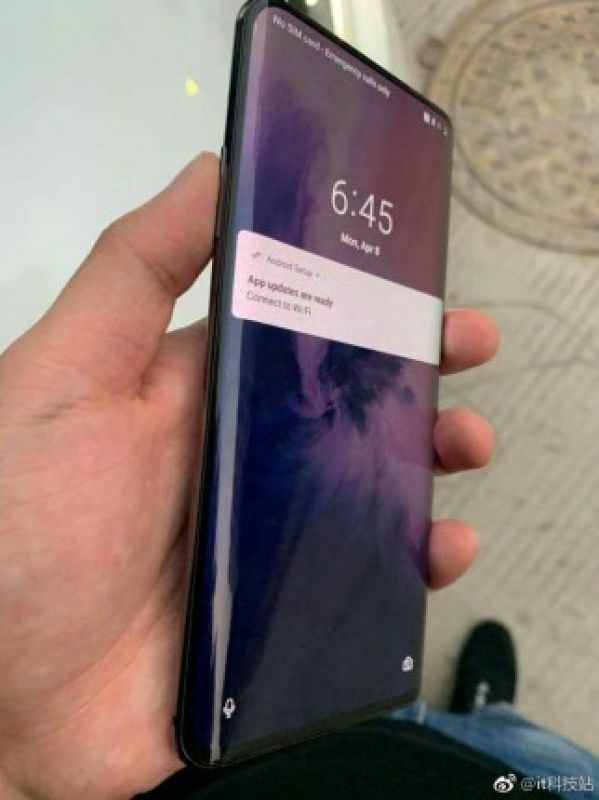 From the leaked images of the OnePlus 7 Pro, we can see that it will sport minimal bezels and a curved screen like the ones used on the Samsung Galaxy S10 and S10+ handsets. The OnePlus 7 Pro features a GM1915 internal model name if the leaked image is anything to go by, then it will come bearing a 6.67-inch Super Optic display, a Snapdragon 855 SoC paired with 8GB of RAM and 256GB of internal storage. The camera specs have been detailed as well with it featuring the trendy 48MP sensor along with a 16MP and 8MP shooters. As far as the OS goes, it comes with Android 9 that features a 9.5.1 GM31CB build number. 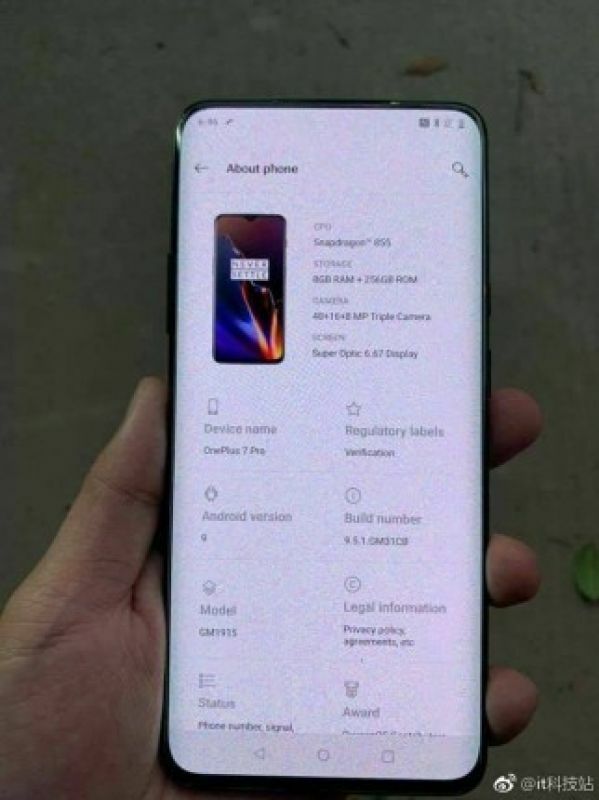 While the leaked image doesn’t specify the same, it is believed that the OnePlus 7 Pro will come with Bluetooth 5.0 since a handset with the GM1915 model number and OS 9.5.1 had recently passed through a Bluetooth certification procedure. The report goes on to state that an interesting take away here is that the said model number doesn’t start with A, a naming scheme that had been prevalent with OnePlus devices since the OnePlus One. This shows us that it will come with 5G capabilities since OnePlus confirmed that the 5G smartphone will feature an altered model name.